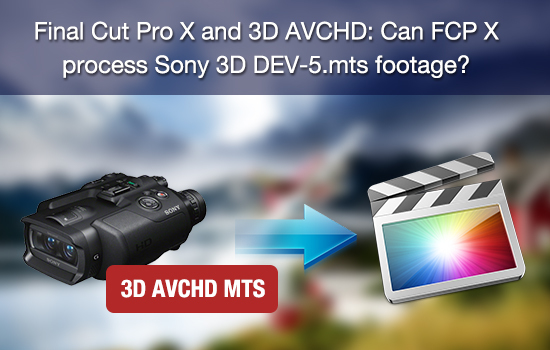 Final Cut Pro X and 3D AVCHD: Can FCPX process Sony 3D DEV-5 .mts footage? 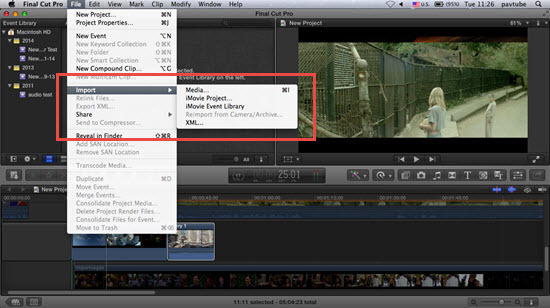 Home » Final Cut Pro X and 3D AVCHD: Can FCPX process Sony 3D DEV-5 .mts footage? "I have the Sony 3D binoculars model DEV-5.It encodes video in 3D HD' MPEG4-MVC/ H.264 AVCHD 2.0 format compatible (1080/60i). Is there anyway to edit this video in the new Final Cut Pro X and maintain the ability to have 3D video? I'm having problem importing AVCHD 3D video into Final Cut Pro X..."
3D is a fascinating technology that was once only reserved for ultra exclusive film studios. Now, many prosumer users can purchase stereoscopic 3D cameras at decent prices. The only problem is finding out how to import that footage into your NLE. Many similar questions are being asked by people who shoot with Sony DEV-5 and other 3D camcorders. With all of the hype surrounding 3D technology and production in the last few years, I found it a bit surprising that Apple didn't include built in tools stereoscopic (3D) editing tools within FCPX. Having the same problem importing 3D .mts to FCP X? Let's go on a little video lover's escapade into the world of digital video and check some cool tools for importing 3D .mts to FCP X. With this plugin, Stereo3d lets you import and export native 3D stereoscopic footage. It also comes with an invaluable preview interface so that you can see your footage. Once you are done, you can conveniently upload your 3D masterpieces to YouTube 3D. Stereo3D Toolbox LE is compatible with the latest versions Adobe After Effects, Final Cut Pro, Final Cut Pro X, Motion and Premiere Pro. This handy app lets you import native 3D stereoscopic AVHCD footage and export Apple ProRes 422 encoded .mov video, which can be imported to Final Cut Pro 7 and X without rendering. 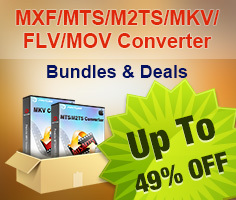 You can convert 3D MTS to 2D MOV video, or encode 3D AVCHD footage to Anaglyphic 3D that is also compatible with FCP X. Meanwhile, the software serves as a universal video converter for QuickTime Player and iOS devices. It handles both 2D and 3D video formats including but not limited to MKV, MOV, MP4, M4V, VOB, 3GP, FLV, SWF, TS, and AVI. Step 1. Backup your 3D .MTS video to hard drive. Install and Launch Pavtube Video Converter for Mac software. After the installation, drag and drop source 3D AVCHD footage to the software by clicking "File">"Add Video/Audio"
Step 2. 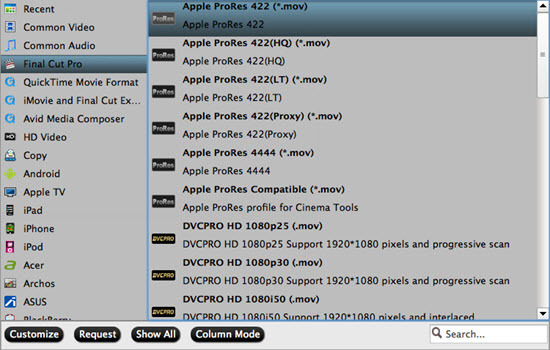 Press on "Format" bar and set "Final Cut Pro">"Apple ProRes 422 (*.mov)" format. When conversion finishes, press "Open" to get converted MOV video. Step 4. Open up FCP X, and go to "File>Import>Files..." to import converted 3D footage to FCP X project.